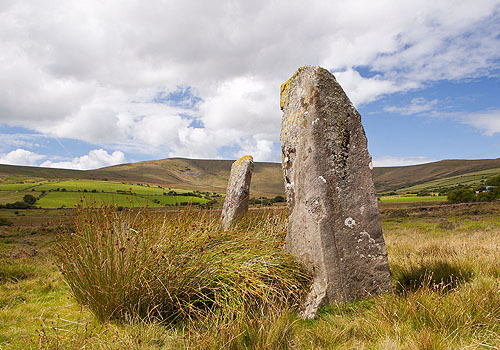 Cerrig Meibion Arthur ( The Stones of the Sons of Arthur ) , is the name given to this pair of Bronze Age standing stones - 2.6m and 2.2m high. According to the Mabinogion the stones mark the site where the sons of the legendary King Arthur were slain by the Twrch Trwyth, a wild boar from Ireland. The stones stand , on moorland, near a track to Cwm Garw , below Foel Cwmcerwyn - the highest peak of the Preseli Mountains.